Reza Aramesh, Action 51, Kerem Shalom, Israel, February 17, 2008. Palestinian prisoners sit blindfolded on the ground after they were captured by Israeli soldiers, 2008, black and white silver gelatin print. Courtesy of the artist. These forms of re-staging and re-framing – referred to as ‘actions’ by the artist – are integral to Aramesh’s work and the source material is often drawn from conflict zones worldwide; the very same zones that often crop up in our daily glut of print and televisual media. In Action 51. Kerem Shalom, Israel, February 17, 2008 (2008), Aramesh drew upon a press photograph of Palestinian prisoners guarded by Israeli soldiers on a border crossing between the Gaza Strip and Israel. As a source photograph, this image remains relatively unremarkable when seen amidst the many other similar ones. And this is perhaps part of the problem surrounding the ubiquity of images that take conflict as their source material, not to mention the precarious lives lived within such zones. There is also another critical element at work here. In Aramesh’s transposition of these scenes and their restaging in other environments, he often leaves out the source of threat and original violence that existed in the source photographs, be it in the form of prison guards or soldiers; all are largely in absentia in the final photographs. Whereas in the source images, the victim and victimizer, prisoner and prison guard, the living and the dead, all appear to be replaying history’s lamentable refrain of the victor and the vanquished, in Aramesh’s finished images such binaries are absent and so too are the certainties we associate with them. 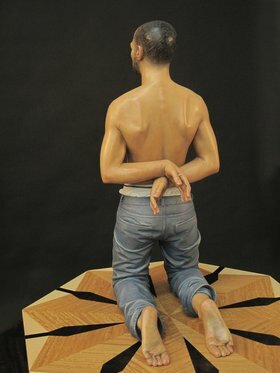 For his most recent show in London, Aramesh’s figures lie prostrate in front of us or kneel abjectly awaiting a violence that is absent in the finished works – the source of the original violence, as noted, having been removed. As viewers of this work, we potentially step into the realm of being a perpetrator in this symmetry of violence and fear. What place, if any, do we have here as we approach these abject figures: are we potentially victims ourselves, potentially subject to the precariousness of what Giorgio Agamben refers to as ‘bare life’, a life beyond recourse to law and justice? Or are we victimizers in waiting, fearful that for all our empathy there is a fine line, in times of conflict and the suspension of law, between being subjected to violence and administering it? One Marylebone Church, formerly Holy Trinity Church. Courtesy of Mottahedan Projects. Anthony Downey: I’ve known your work for some time, having written about it elsewhere and interviewed you a few times over the years. 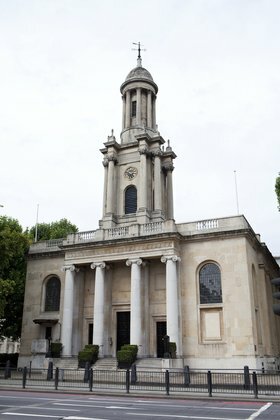 But my first question today is more practical than usual, especially given the extraordinary effect your show at One Marylebone (the former Holy Trinity Church on Marylebone Road in London) has when you enter it: how did you find such a building? Reza Aramesh: I have always been sceptical of putting on a show during Frieze, everyone does it and it can be more trouble than it is worth. However, if the right space came, a space that resonated with the conceptual framework of my work, I agreed I would do it. 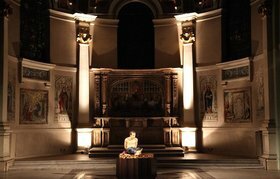 When One Marylebone was made available to me in October, with all its resonances, I knew I had to have it and to do my show there, especially as I had been working on the iconography of Christianity – specifically the seventeenth-century religious iconography of Spain. AD: What first brought you to this imagery? RA: I went to see an exhibition at the National Gallery two years ago called The Sacred Made Real: Spanish Painting and Sculpture 1600-1700. When I saw the works there, including pieces by Diego Velázquez and Francisco de Zurbarán, all the years of my fascination with this type of sculpture – of Catholic sculptures and churches and Venice – came into focus. I was so overwhelmed by the show that I went back almost daily and realized this is what I wanted to do: I wanted to make work referencing this iconography. So, taking Christian iconography and combining it with the subject matter of what I work with, that is, situations involving power and violence, I sought to combine the idea of violence and culture and explore how they are related. In war reportage you experience the whole mechanism of war, and I tried to draw out similarities between that iconography of seventeenth-century Christian martyrdom and how the whole idea of martyrdom has come to be seen in our day: that is, still compared with religious martyrdom. 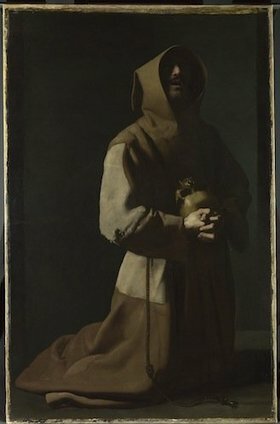 Francisco de Zurbarán (1598–1664), Saint Francis in Meditation, 1635–39. Courtesy and © The National Gallery, London. AD: And showing this work in the context of a church made for the ideal venue given the resonances already there. RA: Yes, absolutely. A church is the obvious place to contextualize these works. The idea of putting this sculpture next to an altar, alongside the ideas of worship and pilgrimage, was both thought-provoking and exciting in itself. The photographs were also counterpoints, they could be from anywhere, they could be from Somalia, Iraq, Iran – one is from the war in Vietnam, which also gives historical resonance to these images. They are not just of the present. We see the lives of people who are affected by wars and in the context of the church they take on an iconic value, something akin to objects of contemplation and worship. But they are also imbued with this idea of martyrdom that I experienced in the show at the National Gallery. AD: There is a perfect combination here between the subject matter and the context, and the one thing I want to push a bit further is this: were you attracted to Christian iconography because it is symbolic of suffering, the suffering of the saints, the suffering of Christ and so on, or was it the aesthetic, visual context of Christian iconography? Were you attempting to in some way replicate – or reinvigorate – this aesthetic of suffering because your sculptures are ‘perfect’ in a way that symbolic Christian sculpture is perfect? RA: Yes, totally. They go hand in hand. In my photographs as well, when I am communicating the idea of violence – the idea of suffering, be it psychological or physical torture – it is important that in commenting on a subject of that magnitude, how I ‘say’ it, or aesthetically produce it, is going to have an impact on the viewer. How a viewer receives that information, the visual content, and thereafter the conceptual information, is integral to the actual aesthetic in which it is delivered. As a viewer of these works, both the sculptures and the photographs, you are drawn to the image and you are also drawn to the setting and the installation of the work. This is not about violent images but the imagery of violence. This is my understanding of what Christian iconography does. There were saints that were made for churches, for places of worship, and the suffering of these saints, the way in which it was presented and the context in which it was presented, was the first thing that drew viewers in. And then they had to think about suffering and the relationship of suffering to violence and injustice. This was of course, in Christian iconographic terms, essentially about conversion and persuasion. I think my images are referring to a more secular realm: how do you get a viewer to consider suffering without either over-aestheticizing or pushing it in their faces? How can you get people today to consider suffering worldwide? Reza Aramesh, Them Who Dwell on the Earth, 2011, installation detail. Courtesy of the artist and Mottahedan Projects. This has always been central to my work, from the very first action pieces: can restaging violence and oppression, in different contexts, engage with the original act of violence, or at least get us to think about that act? To even explore that question, we need a viewer who is willing to engage with such images – and for that you need to invite them in. AD: There is a very interesting thing happening here, because in the subject matter you are dealing with there is a clear political dimension, but the political dimension is secondary to the aesthetic insofar as the viewer is brought into the realm of suffering and modern-day martyrdom through the aesthetics of the work, the way it frames its imagery, presents itself in figures of photographic form, and the sheer verisimilitude of the sculptures. I saw many people on the opening night peering at sculptures from literally inches away as if in disbelief that they were not real, perhaps in a manner similar to pilgrims in seventeenth-century Spain. So there is a sense that you are disarming the viewer, lulling them in, being disarmingly inviting for reasons that only later become clear. Could you talk a little more about that because it is also a part of the aesthetic, the inviting in, the showing, the configuration of what can be seen and what remains unseen. Reza Aramesh, Action 110, 2010, silver gelatin print on aluminium. Courtesy of the artist and Mottahedan Projects. RA: Again, this is critical. When I came to curate these works, I had to find a relationship between the photographs and the sculptures, and then between the sculptures themselves, and the relationship to the entire space. One of the photographs shows a father washing the body of his son for burial. It was sourced from an image originally taken in Fallujah in 2004. Another image here, from a different source, also involves a father who has just seen the body of his son. I used both of these images around the altar in the church, bearing in mind the relationship of the altar to scenes from the deposition of Christ and the washing of his body – both, incidentally, key themes of The Sacred Made Real show. The point here was to create a dialogue between what could be seen and not seen. Similarly, I want a relationship like that to occur with the sculptures. I wanted them to generate a relationship between one another. On a perhaps more literal level, you can see that these sculptures come out of scenes that involved violence but the source of that violence is often absent, and we are invited to contemplate not only its absence but our possible implication in the tableau before us. AD: Could you talk a little bit more about the iconography that you find in newspapers and in hard-copy media and how you use that iconography presently? Why do you choose the images that you choose? Reza Aramesh, Action 107, 2011, polychromed limewood, glass and wood veneers. Courtesy of the artist and Mottahedan Projects. RA: When I’m researching these images online, from hard-copy newspapers and any other visual information I can get, I don’t look to find similarities between them and Christian iconography or Renaissance painting, but these similarities keep recurring in my mind. The source images also attract me – I am drawn to the aesthetic of violence, not so much violent imagery, as I noted, but the violence of images. I am fascinated by violence as I am fascinated by the gestures that imply psychological and not just physical violence. To have your hands tied behind your back is a physical form of violence but it is also a psychological one, you are disarmed, subdued and vulnerable – you have no control and that is a form of violence that can be internalized but that leaves no mark of the violence itself. This then becomes a question of what you leave out of these images. I don’t take everything that I see in the image – the bandage, the blood, the overt signs of violence – and the reason goes back to this sense of invitation: I want the viewer to both empathize with the apparent victims here but also be in a position where they could conceivably administer violence themselves. They can find themselves before a helpless being and thereafter consider what it is to be not only a victim but also a victimizer. So by taking the physical tools of torture and the means of violence out of these images – be they photographic or sculptural – I am creating different positions for the viewer to behold. AD: I would like to push that further: what do you mean by this? RA: I think we have discussed this before in relation to a different body of work: the oppressed often becomes the oppressor because the oppressed doesn’t know any other form of language. They have been subject to oppression and cannot go beyond its binary symmetry. The oppressed must learn the language of the oppressor, in order not to fall into the trap of employing it when the oppressor is finally overthrown. To be the subject of violence often creates a reciprocal need to administer violence but for progress to be made, for suffering to be alleviated, that cycle must be broken. This is not about revenge but reconciling the injustice of violence and making us all responsible for it. Perhaps this is the key to understanding suffering: a sense of not just being the victim but the potential victimizer too. Reza Aramesh was born in Ahwaz, Iran, in 1970. He completed an MA in Fine Art at Goldsmiths, University of London, in 1997, and has since appeared in several solo and group exhibitions around the world, including in the UK, China and Dubai. His most recent show in London, curated with Mottahedan Projects, was entitled Them Who Dwell on the Earth and was on display at One Marylebone from the 13th to the 16th October 2011. He lives and works in London. Ararmesh, Reza. “Restaging the (Objective) Violence of Images Reza Aramesh in Conversation with Anthony Downey.” Interview by Anthony Downey. Ibraaz. Ibraaz, 1 Nov. 2011.